Lotte Hotel Vladivostok is situated in the heart of Vladivostok, the city blending European and Oriental cultures. The hotel is ideally located within walking distance from historical places, museums and shopping areas. Every detail of the guest rooms and suites makes the stay at the Hotel comfortable. Thoughtfully appointed rooms serve to comfort. The hotel offers Standard rooms with private bathrooms, minibars and fridges, satellite TV, direct-dial telephones, electronic locks, air-conditioning. Suites have separate living rooms with sofa sets, private bedrooms, two TV-sets and standard amenities. 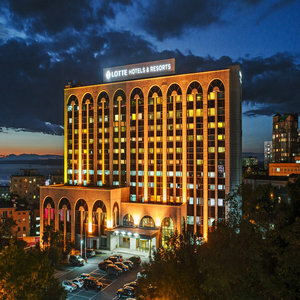 The best suite is located at the upper 12th floor of the hotel and opens a great view at Vladivostok and the Golden Horn bay. The Presidential Suite has a separate living room with a cozy sofa set, electric fireplace, working desk, dining table and chairs, TV, a private bedroom and bathroom with a bath, jacuzzi and other amenities. Distinctive hotel restaurants offer a variety of dining experience from national cuisine to the best samples of international cooking. The Haekeumkang restaurant features the original Korean cuisine in the atmosphere of Korean traditional design and paintings. The Pacific sky-bar and the Rendezvous cafe are also at guests' service. The Diamond banquet room is a hall for the most impressive social and business events in Vladivostok. It accommodates up to 300 people for cocktail reception. The best stage lighting equipment and collection of the best audio-video facilities will make any business event, conference or wedding party a success. Rooms "Emerald", "Ruby", "Opal" are nicely decorated and convenient for smaller parties and seminars. The hotel's health club offers gym, swimming pool, sauna, massage. Other hotel services and facilities include: a business centre (telefax, PC, Internet), safe deposit boxes, laundry, concierge service, beauty parlour, flower and souvenir shops.